Nestled in the rolling hills outside of Pittsburgh, Pennsylvania, Oakmont Country Club often ranks among the top 5 golf courses in America and has hosted more major championships than any other golf course in the nation. Oakmont also prides itself for being the first U.S. golf club to be (in 1987) as a National History Landmark. Oakmont is most well-known for its extremely fast greens, thick rough, and its trademark church pews, the turf-laden bunker between the third and fourth fairways. "A shot poorly played should be a shot irrevocably lost," said William Fownes (son of Henry Fownes) about Oakmont. The world championship golf course at Oakmont Country Club is the only golf course in the world designed by Henry Fownes. Opened in 1903, the Oakmont golf course is considered by many to be the toughest golf course in the United States. While changes are to be expected over the course of a 100-year history, the greens on the Oakmont golf course remain virtually as they were originally designed. Oakmont is a true golfer's course with super fast greens, 200-plus bunkers, and Scottish-style links with no water hazards. Par for members is 71, although this was dropped to a par 70 for players in the 2007 U.S. Open. The picturesque 456-yard 18th hole at Oakmont has been called by many the best par-4 in golf. This famous hole suffers a bit of competition from its neighbor at the beginning of the course, however. The par-4, 482-yard opening hole was once voted the PGA Tour's most difficult. Seven parallel bunkers, each separated by a high ridge of grass, have been part of Oakmont since its early days. It wasn't until the 1935 U.S. Open that the bunkers were wrapped around the ridges to connect with one another to form the now famous "Church Pew Bunker," with its grass ridges forming the pews in the sand bunker. 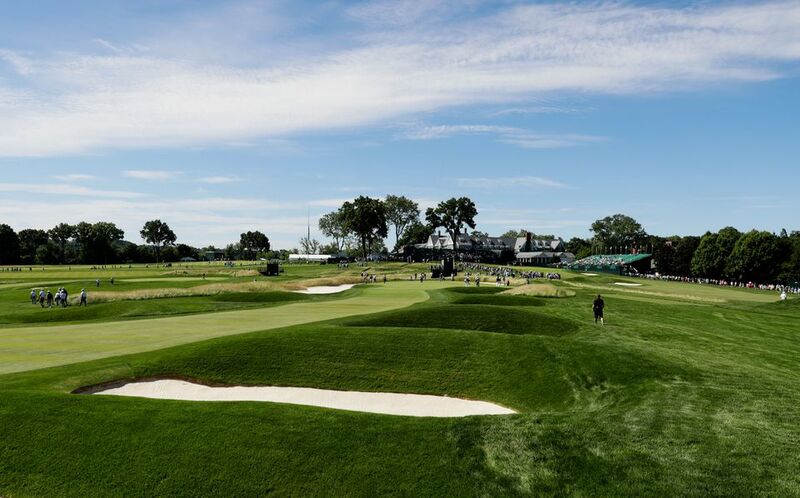 It's unclear when locals started using the "church pews" term to describe Oakmont's now famous bunker, but the nickname appears to have hit the national stage for the 1962 U.S. Open where it appears in the program and in news articles covering the event. Oakmont has been selected as host of the U.S. Open nine times (1927, 1935, 1953, 1962, 1973, 1983, 1994, 2007, and 2016) more than any other course. It has been selected to host the 2025 tournament as well. In addition, three PGA Championships, five U.S. Amateurs and the U.S. Women's Open have been held at Oakmont Country Club. Oakmont was also selected to host the 2010 U.S. Women's Open. After standing for over 100 years on the same spot, Oakmont's stately gabled clubhouse still looks very much the way it did when it was first constructed. The two story Tudor-style clubhouse feels much like a comfortable country home. Clubhouse restoration that took place from 2002 to 2007 managed to keep up this tradition. Important structural and mechanical components were upgraded, but the locker room is still not air conditioned and spike marks still grace the benches and floors. Old photographs of tournaments played at Oakmont hang in every room. An entire wall is dedicated to the 1962 U.S. Open playoff between Jack Nicklaus and Palmer. In 1953, Ben Hogan won the U.S. Open for the fourth time at the age of 40, defeating Sam Snead by six shots. A 24-year-old amateur from Latrobe, PA, named Almer Palmer made his first U.S. Open field as an alternate but missed the cut. Jack Nicklaus won his first major championship at the 1962 U.S. Open held at Oakmont, dethroning western Pennsylvania native and crowd favorite Arnold Palmer. The round acclaimed the greatest of the 20th century was played at Oakmont in 1973. Johnny Miller played the final 18 holes in just 63 strokes (8-under-par) to win the U.S. Open. He began the round six strokes behind the lead foursome which included Arnold Palmer. This final-round U.S. Open scoring record has never been beaten. Forrest Fezler became the first player in U.S. Open history to wear shorts when he used a portable toilet for a quick change after the 17th hole. Oakmont Country Club is located, not surprisingly, in the community of Oakmont, PA, 14 miles up the Allegheny River from downtown Pittsburgh. From I-76 (Pennsylvania Turnpike) take exit 48 (Allegheny Valley). Go south towards Pittsburgh approximately 2 miles. Turn left onto Hulton Bridge. Follow Hulton Road approximately 1 mile to the golf course. The entrance to Oakmont is on the left.